Construction The housing is constructed from a lightweight glass-reinforced epoxy composite material with a contiguous interior metal-plated coating. The unit is hermetically sealed with a metal-to-metal solder joint providing stability during changes in temperature and humidity. The solar array is encapsulated in silicone and covered with a polycarbonate window for added durability. * Neoprene pad not included in these dimensions. ** Matte finish does not apply to the polycarbonate window covering the solar array. Introduced in the mid 1990s, the Solar 50g PTT was our first solar-powered device. It combined the sturdy qualities of our Battery Powered PTTs with miniature solar arrays and solar-powered rechargeable batteries to create a long-lasting device with controlled battery charging and a customizable transmission schedule. Since its introduction, the 50g PTT has been updated many times to incorporate our latest technology. The Solar 50g PTT is constructed with harnessing tubes and comes standard with a reinforced antenna base. 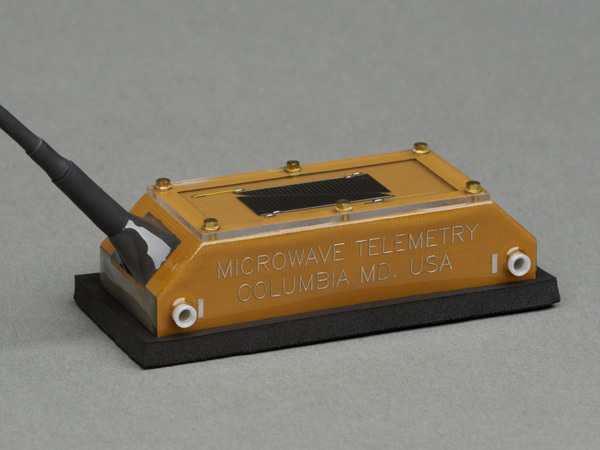 © Copyright 2019 Microwave Telemetry, Inc.